The first and the only Polish DJ ever asked by the world’s most recognized club brand Ministry Of Sound to mix their compilations. The first and the only Polish DJ who shared the stages with Sting, Queen, Adama Lambert, Carlos Santana. The first Polish DJ who performed during the New Year's Eve celebration party hosted by the Mayor of Krakow at Krakow's Main Square for the crowd of 110 thousand people. One of the most recognized figures on the Polish clubbing scene. ADHD had the honor to share the stage with such personas as Sting, Queen, Paul Oakenfold, ATB, Mark Knight, ATFC, Shapeshifers, DONS, Stonebridge, Ian Carey, Sonique, Funkagenda, Kim Fai, Koen Groeneveld, Hoxton Whores, Boogie Pimps, Dr Motte, Moguai or Raul Rincon – just to name just few. The Head of Music of RMF Club - the biggest Polish Internet radio station playing non-mainstream club music 24/7. The station is also a home to his monthly radio show "For The Love Of House", which contains an eclectic selection of the newest and the most interesting at the moment tunes of widely understood house music genre. 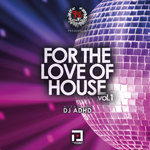 "For The Love Of House" is available as a free download at iTunes podcasts directory. Co-host of weekly radio show "Hop Bęc In The Mix" on the Polish biggest CHR radio station RMF Maxxx. Every Saturday at 8PM (CET) he mixes live-on-air 240 minutes of the best biggest hits from the 15-years history of Polish most recognized radio CHR Top20 chart show "Hop Bęc"